Jesus, how do I make disciples? What does it mean to baptize them in the name of the Father, the Son and the Holy Spirit? 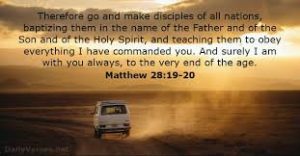 To make disciples is to show people the way to Me. The “way” is to show them who I AM, who they are in ME, and how to live in the world and in community to serve the Kingdom purposes of bringing people to Me for eternity. To baptize means to submerge in the Living Water, to show people how to live out of the fullness of Jehovah, Elohim- the Trinity; This includes the Father’s will, the Word/Truth/Way- Jesus, and by the Power- of the In-dwelling Holy Spirit. Each believer has their reach of people for which I have allowed them to have influence. The goal is to lead and influence the whole world. My heart is for everyone that I have created in all of the nations to accept Me for salvation. Many will say no to ME. But, the collective body of Christ has the mission to bring as many as possible to a saving relationship with Me so they may live the abundant life now and forevermore. Thank you Lord. I appreciate understanding the baptism a bit better too. Jesus, how do I make disciples? My child, I do not have a specific formula for you to make disciples. As you pray and fast, I will give you directions. More importantly, build good relationships with people and give your testimony. Spend time with people and do bible studies to develop them as disciples. Plant churches as I direct you. Spread the gospel as I direct you. I know the needs of each person’s hearts and where I would like to touch their souls. What does it mean to baptize them in the name of the Father, the Son and the Holy Spirit? Water baptism is cleansing and the living water flowing from the heart, is an act of faith so that Holy Spirit can dwell in you. Thank you, Lord Jesus for enlightening me. There are different ways to make disciples, but for you, My beloved, you are to know, apply, and demonstrate My Word. Teach by example. Be sensitive to who I place in your circle or in your path and reach out to them by sharing your heart and your faith. By being an example of living out your faith, you become a teacher/mentor. But remember that you can do nothing without Me. I will be your Guide/Counselor in these relationships. Commune with Me often so you do not walk out on your own. As I communed with the Father while bringing up My disciples, you must commune with Me to encourage the ones I have placed under your care. Baptizing them in the name of the Father, the Son, and the Holy Spirit is putting a seal of protection on them. It’s an outward expression of My covenant with them that I will be with them always. Though this is NOT a guarantee that life will be easy, it IS a guarantee that they have direct access to Me when they call. Like the Father authorized Me, I am authorizing you to baptize in Our name. This baptism doesn’t refer to water baptism, but refers to My union and identification with them.